Casual and cozy coastal style that is so chic that it makes us want to redecorate our living room. Simple beige and blue textures gives this living area a refreshing vibe and those pillows… Need we say anymore? Linen is naturally cool, comfortable and breathable and becomes even more supple the longer you use it. It’s luxurious look is one of our favorites. 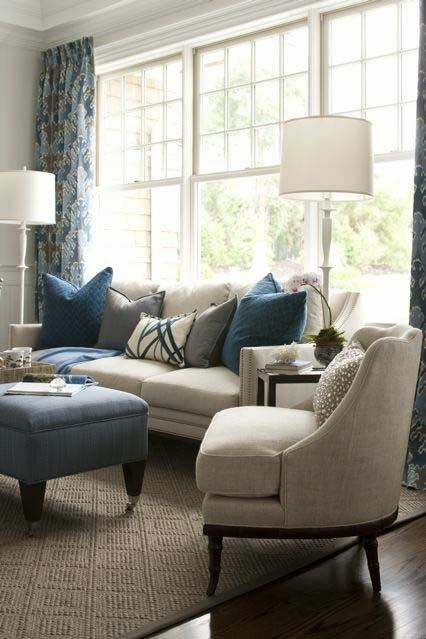 If you are looking to add a pop of color to your room just add a few throw pillows in a refreshing green or blue. Every once in a while we go in search of inspiring coastal furniture. We found this sail cloth headboard on Coastal Living.com and thought it would be a really cool DYI Project. Now we just need to find some recycled sail cloth! Does anyone know where we can find some?